Hello Frndzzz.... www.dealsnloot.com Again Back With New Bus Booking Deal. AbhiBus offering Bus Booking Rs.200 Cashback on Rs. 400. 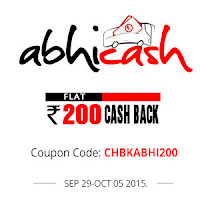 Offer valid only on 29th Sep 2015.